So, I'm back to finally finish my Disney recap! IF ANYONE STILL CARES. Today, our last day there ... tomorrow, our journey home and the weekend. - Park Hopper passes are the bomb. 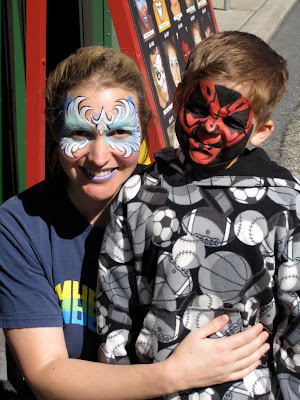 - When a mommy has to stay behind with a sick baby at the hotel for a day, the daddy will allow the 5-year-old to have his face painted like Darth Maul. DARTH. MAUL. OH YES HE DID. - Disney is no more free of germs than any other public place. - Those germs will jump on you, climb down your throat, cling to the very fiber of your being, follow you home on the airplane, and wreak havoc on your life just like they do when you meet those same germs at home. - You will have to fight the urge to let the germ infestation color your perception of an otherwise lovely trip, but it CAN be done. Sometime amidst all of the public-restrooming, licking ice cream off of tabletops, and eating snacks right out of other people's strollers, Jake picked up a stomach bug germ. I JUST CAN'T IMAGINE HOW THAT HAPPENED. Around 3:45 Thursday morning, we awoke to the sound of Jake throwing up in the Pack-n-Play. VACAY FUN! He was sick again an hour later, and was running a fever when he finally woke up for good a few hours later. We decided that my mom and I would stay at the hotel with Jakey for the day while my sister, dad and Grayson took the older boys to Hollywood Studios and EPCOT to catch up on a few things they might have missed earlier in the week. 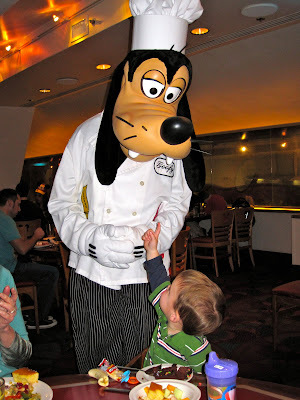 I hoped that we could meet them later at Chef Mickey's for our scheduled supper if Jake was feeling well enough by then. We played with Jakey in the room until it was time for lunch, then decided to see if he could (or wanted to) eat anything. We ate a quick-service meal on the boardwalk at our hotel ... this was the view from our picnic table! But he wasn't interested in the rest of it. Understandably. 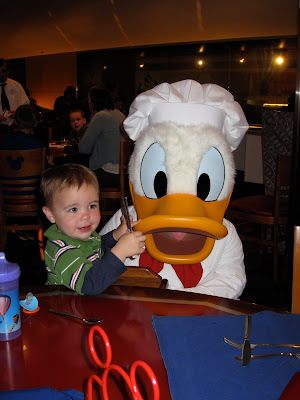 They don't exactly offer stomach-bug-recovery food at the quick-service meal places at Disney. No chicken noodle soup or crackers in sight. So he ate two bites of his meal and was ready to go home. While he was back at the hotel taking his nap, the rest of our crew was footloose and fancy-free at Hollywood Studios and EPCOT. Without the double stroller, backpack and 2-year-old (plus two other adults), they were able to do SO MUCH! They spent the morning at Hollywood, where Nick and my sister both got their faces painted. You know, when I was supervising the face painting earlier in the week, Nick left with a tiger motif. When GRAYSON was supervising, we ended up with our very own Darth Maul. O.M.G. I was freaked out when I first saw him, and I thought JAKE was going to CRY. Seriously. This could give me nightmares. I don't like seeing my baby look like a creepy movie character, but I must tell you that I think it was one of the highlights of the trip for him. He got really into it. So while they were off doing all that, Jake took a great nap, and I was thrilled when he woke up feeling much better. Yea for rest! I was thrilled to be able to load him up and take him with us to the Contemporary for supper, because it was our last night at Disney and our last chance for him to see the characters. As soon as we arrived, they took a group picture of us with a resin Mickey. Note our charming Darth Maul, who really adds some je ne sais quoi to the picture. I got a plate full of desserts hoping that one of them would be dee-lish, but thank goodness I had the presence of mind to grab those Reese's Pieces, because that's what I ate and left the other stuff on my plate after one bite each. Note to self: REESE'S PIECES NEVER LET YOU DOWN. All of the characters came over to say hello to the kids, which was GREAT. I love the character meals for that reason. Mickey didn't bat an eye at Darth Maul, who was doing his best to stay in character. And although ultimately I feel like we waited one year too long to get Nathaniel here before the Magic of the characters sort of wore off, he still agreed to have his picture taken with them a few times. Jake loved meeting them all, and he was just charming with them, as they were with him. It was so much fun to see him enjoying all of their costumes! Even Darth Maul let his guard down a couple of times and gave us a smile. After supper, we tried to get to the Magic Kingdom in time for the Spectromagic parade, but the Monorail took about 45 minutes to get us there (we could have walked it in probably five), so we missed the parade. HOWEVER, we made it in time for the Wishes Fireworks Show, which Jake and I had seen from afar earlier in the week, and I desperately wanted to see it from inside the park. I also thought it would be something fun to see with my sister, so we staked out a good spot right in front of the castle. Grayson took the big boys to ride Big Thunder Mountain Railroad again (they rode it five times leading up to and during the fireworks), because hey! Don't waste any time in the park! Incidentally, Grayson said that the ride during the fireworks was probably his favorite moment of the week. If you haven't been before, they light the castle up with these lights that change colors prior to and during the show. It's beautiful. And when the show starts, it's breathtaking! It's all timed to music and takes you through about 10 of the iconic Disney movies with characters' voices and themesongs. My sister was in awe and Jakey clapped through the whole thing. It ended with a grand finale of colorful fireworks and music swelling to huge heights, and I was so thankful that we'd made it. The walk out of the park after the show was over was sort of brutal ... thousands of people departing at exactly the same moment. It was pitch black and there were people crowded hand to hand, back to front. Every time I had to slow the stroller down to wait on people to move, Little Man popped out from under the canopy and looked back at me as if to ask, "WHAT'S THE HOLDUP, LADY?" All in all, that was a wonderful way to end our week there. We were exhausted, some of us physically sick, but happy to have had such a memorable experience at Disney World. DISNEY NOTE: Park hopper tickets were GREAT for us this trip. On this one day, our family was able to go to Hollywood Studios, EPCOT and Magic Kingdom. Since our first day at Hollywood we had Jake with us and were finding our way around the park, we didn't get to do everything we wanted to. Having the option to go back the following morning to do a few things and then move on to another park was a welcome luxury! For those of you planning a trip, I personally think it's worth the extra money you pay to have this kind of flexibility. Be back tomorrow with notes about our trip home, then it's back to our regular old life! thanks so much for all these updates - I loved living vicariously (well, not with the illnesses, but the rest!). Glad you had a mostly great trip! SET, no biggie. Even though I didn't care for it, Nick LOVED it. Small price to pay for such joy. 3X, I'm glad you've enjoyed the posts! And I hope your house is spared the icky stuff that our house has had over the last week!